The sporty Veloster coupe features a single door on the driver's side and two doors on the passenger side, an arrangement similar to that used on Mini Clubman. SEOUL -- Hyundai Motor Co. said on Tuesday that it will begin delivering its new sporty three-door Veloster coupe this week after labor disputes delayed the production of a key model at the heart of the South Korean firm's major push into the premium car segment. The car was unveiled at the Detroit auto show and will compete against cars such as Volkswagen AG's Scirocco. It will cost about 20,000 euros in Germany, compared with the Scirocco's price of 22,500 euros. The car features a single door on the driver's side and two doors on the passenger side, an arrangement similar to that used on Mini Clubman. Hyundai said the Veloster's door configuration makes it more practical than a traditional two-door coupe. A Hyundai Motor spokeswoman said on Tuesday that it plans to roll out the Veloster in Europe in the first half of this year and North America and other regions in the second half. Persistent labor disputes and limited capacity expansion plans remain the biggest hurdles for Hyundai's growth as it seeks to halt a slide in market share at home, one of its most lucrative areas, and as consumers increasingly switch to imported brands. Premium models from BMW AG, Daimler AG's Mercedes-Benz and Toyota Motor Corp.'s Lexus brand have dominated the imported vehicle market, but strong demand growth from younger consumers is driving sales of more affordable, mid and small-sized models such as Volkswagen AG's Golf, BMW's Mini and Toyota's Camry. 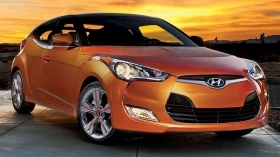 "The Veloster has a significant meaning for Hyundai. It is Hyundai's first premium model targeting young drivers and also its first model that reflects Hyundai's new brand slogan," said Lim Eun-young, an analyst at Dongbu Securities. Hyundai is rebranding its image this year as a maker of value-for-money vehicles into one that it says evokes "new premium" at affordable prices. "But Hyundai has to overcome labor issues involving subcontract workers and a new shift system (to keep solid growth)," Lim said. Labor issues have been one of the biggest hurdles for South Korean automakers and Hyundai experienced annual labor strikes every summer over the last two decades until 2008. Protests by Hyundai's unions over its plan to reallocate workers hit production of the Veloster and the Accent sub compact car at one of its plants in the southeastern city of Ulsan for more than two months from mid-January. Shares in Hyundai rose 42 percent so far this year to record highs, beating a 8 percent rise in the wider market , which is also at record highs.